Bebe Rexha was nominated for Best New Artist at this year’s Grammy Awards. She ended up losing to Dua Lipa, but she definitely looks like a winner in this dramatic red dress. It doesn’t get more classic than a red dress on the red carpet. Bebe’s even paired this dress with a gorgeous pearl necklace, just to amp up the glamor. I love how she’s taking a minute to sit on the red carpet. Standing in heels can be really tiring. 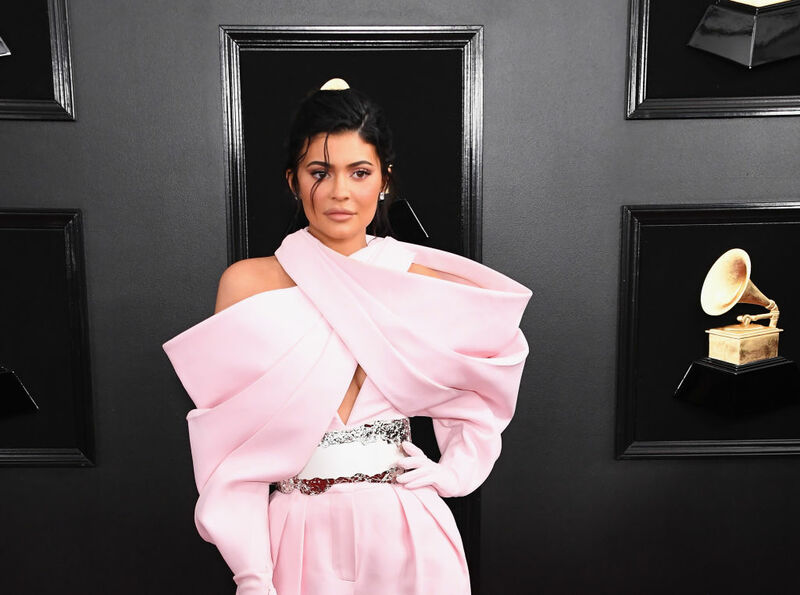 Kylie Jenner attended the Grammys to support her man, Travis Scott. Travis was nominated for multiple Grammys this year, and he performed on the Grammy stage. Even though Kylie isn’t a musician, she wasn’t going to blend into the background at this event. When does Kylie ever blend into the background? She showed up to music’s biggest night wearing a bold pink dress with huge off the shoulder gloved sleeves. 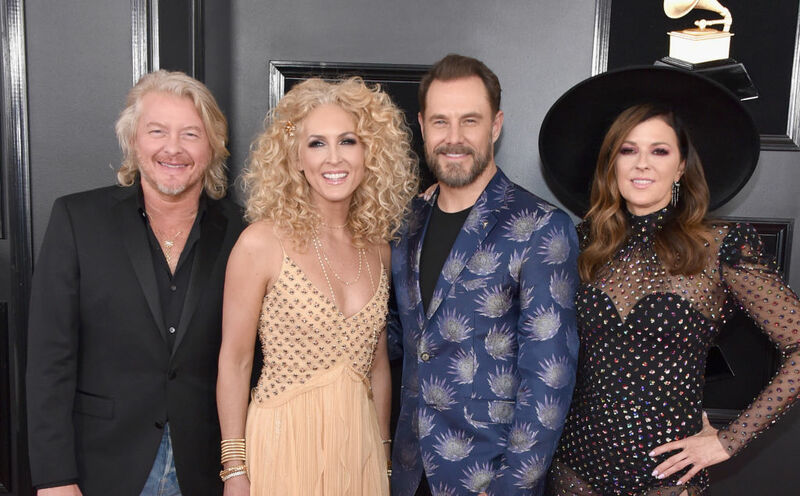 This country act clearly co-ordinated their outfits with each other, but they don’t look too matchy-matchy, which is ideal. Nobody’s clashing with anybody else, and nobody looks like they’re trying too hard to fit in either. I love the rhinestones on Kimberly and Karen’s dresses, and Jimi’s blue suit is unique and interesting without being too loud. I think Jimi’s suit is kind of the star of the show in this picture. Alicia Keys hosted this year’s Grammy Awards, and she changed up her look several times over the course of the evening. She first walked on stage in this teal boho dress with a multicolored headscarf. She later changed into a low cut black top with silver trousers. Alicia Keys looks gorgeous in everything she wears. She absolutely slayed her first major hosting gig, and at one point she even played two pianos at once. Dua Lipa may have worn silver to the 61st Annual Grammy Awards, but she took home the gold. Dua Lipa won a Grammy for Best New Artist and gave a pretty moving acceptance speech. Dua thanked her fans for supporting her music right after she performed with St. Vincent on the Grammy stage. This silver dress is doing all the right things for Dua Lipa’s body. You can definitely tell that it was made for her. The award for most unique dress of the night clearly goes to Cardi B. Cardi B won a Grammy Award for Record of the Year for Best Rap Album, becoming one of only a handful of female artists to ever win in that category. This dress makes it look like Cardi is part of some kind of intricate flower. Either that, or a mermaid emerging out of a seashell. Offset looks pretty handsome too. Katy Perry performed on the Grammy stage with Dolly Parton, but before that, she walked the red carpet in this oddly shaped pink number. Do you think Katy looks like a tulip, a Bellsprout Pokémon, or those Barbie toilet paper covers that every Grandmother seems to have for some reason? I don’t think Katy Perry is pregnant, but a dress like this would be a great way to hide a budding baby bump. Maren Morris had a pretty exciting year, and she showed up to the Grammys to celebrate her accomplishments. Her hit song, “The Middle,” was nominated for Song of the Year, Record of the Year, and Best Duo/Group Performance. Maren didn’t take home the Grammy in any of those categories, but her song was basically the song of the summer, so that’s something to be proud of. This dress with a yellow flower pattern and yellow flower appliqué is absolutely stunning on her. Lady Gaga performed her heart out on the Grammy stage this year. She sang her song “Shallow” from A Star Is Born, but this time, she performed it with Mark Ronson instead of Bradley Cooper. 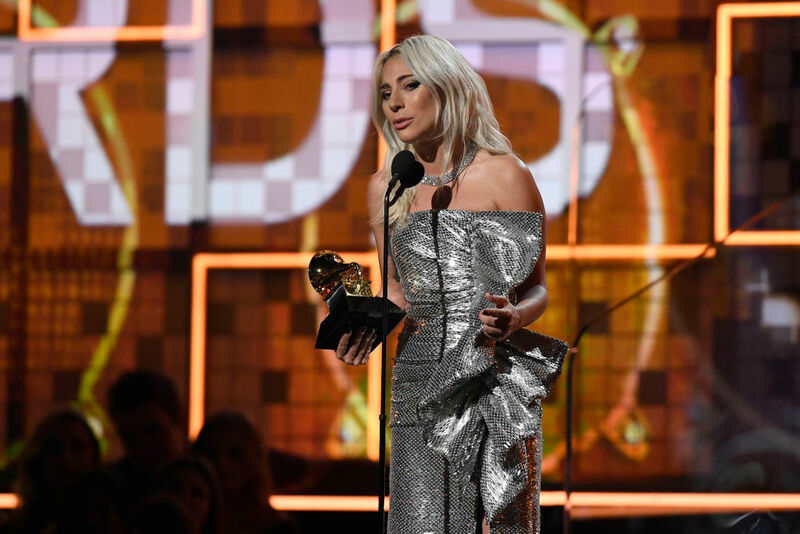 She gave an impassioned performance, but before that, “Shallow” won two Grammys, one for Best Pop Duo Performance and one for Best Song Written For Visual Media. Lady Gaga walked the red carpet in this silver dress with a frill detail. Anna Kendrick presented an award at this year’s Grammys in this short and fluffy pink dress. Anna looks as cute as a button in this dress which shows off her long legs and adorable figure. 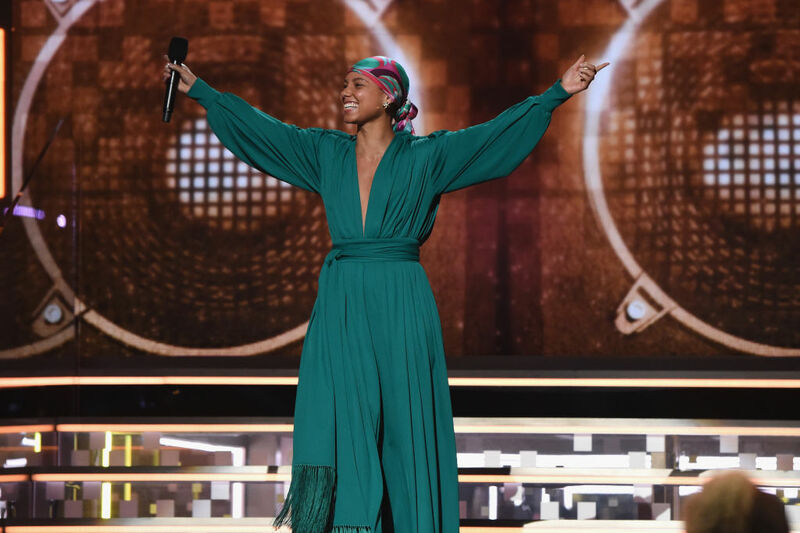 Jada Pinkett Smith showed up to the Grammy Awards without her husband, Will Smith, who appeared in a new trailer for the live-action remake of Aladdin that aired during a commercial break. Jada introduced the Grammy Awards with Alicia Keys in this tan colored dress with a feathered train. I think this was one of the most magical dresses of the evening. I know not everyone is into feathers, but I think they’re super fun. Ashlee Simpson must have also gotten the feather memo because she showed up to The Grammys in this silver dress with feather detailing. Ashlee’s husband, Evan Ross, wore a red velvet suit jacket with details around the lapel that matched Ashlee’s dress. Evan Ross is Tracee Elis Ross’ brother and the son of Diana Ross, who was honored at the Grammy Awards because she’s turning 75 in March. Evan and Ashlee attended the award ceremony to support Diana. 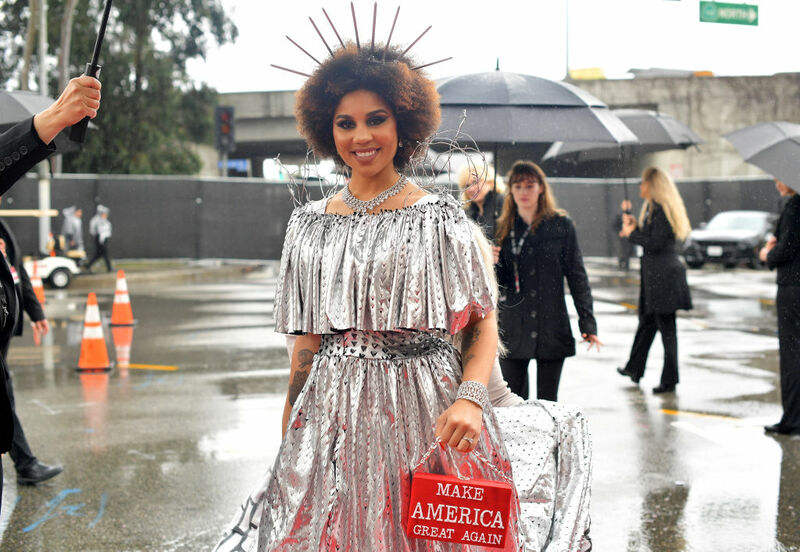 Singer Joy Villa made waves across the internet again this year for wearing pro-Trump attire to the Grammy Awards. Villa pulled a stunt like this last year, and she wore a pro-life outfit the year before that. Under her silver cloak was a white dress with a brick pattern that said “build the wall” in big red letters on the back of it. I think that’s supposed to be barbed wire on her shoulders. 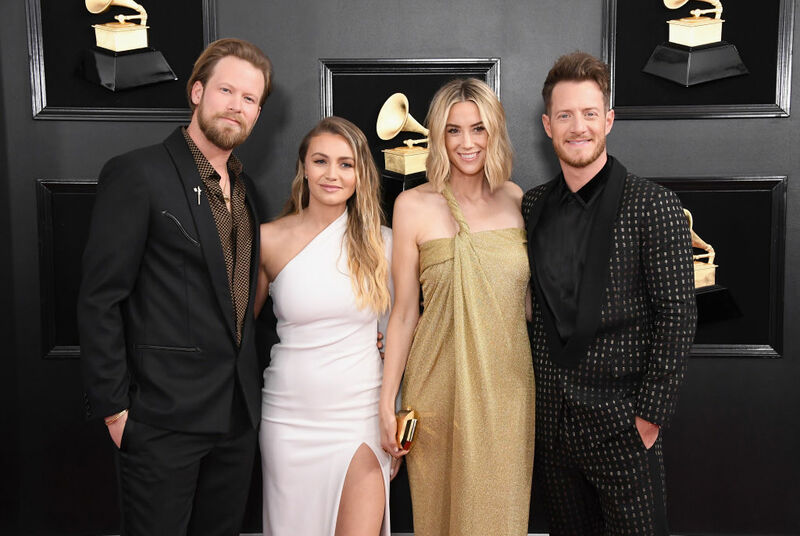 Metallics seem to be a thing at this year’s Grammy Awards. YouTube star Lele Pons wore this champagne gown with a long, embellished train and sheer knee-high boots on the Grammy red carpet. Lele Pons presenting at the Grammys shows that the lines between internet star and regular star are getting blurred. At this point in history, internet stars are basically just stars. Lele looks stunning in this dress, but more importantly, she looks like she deserves to be at the Grammys. Lilly Singh is another YouTube star who looks like she’s made it in the mainstream. She’s collaborated with some of the biggest stars in the business, and her girl power mantra is making waves all over the world. 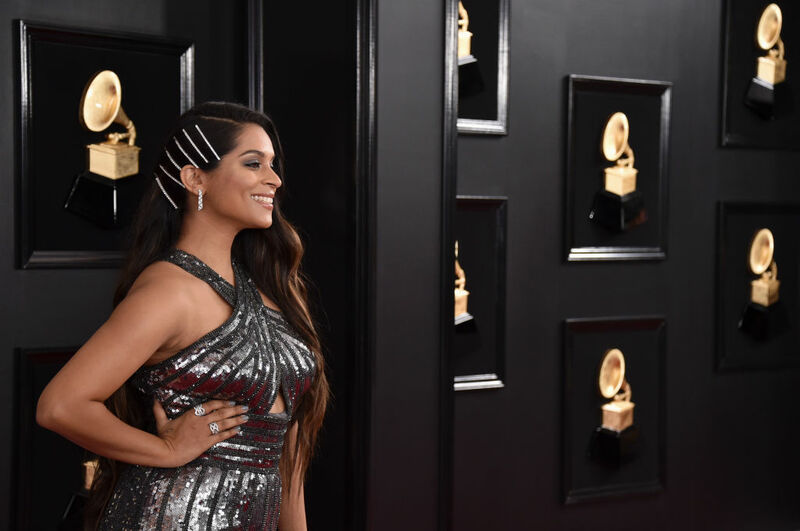 It looks like Lilly got the silver memo, because she walked the red carpet in this silver halter dress. The clips in her hair took this look right over the top. Our YouTube queen is representing the internet well. 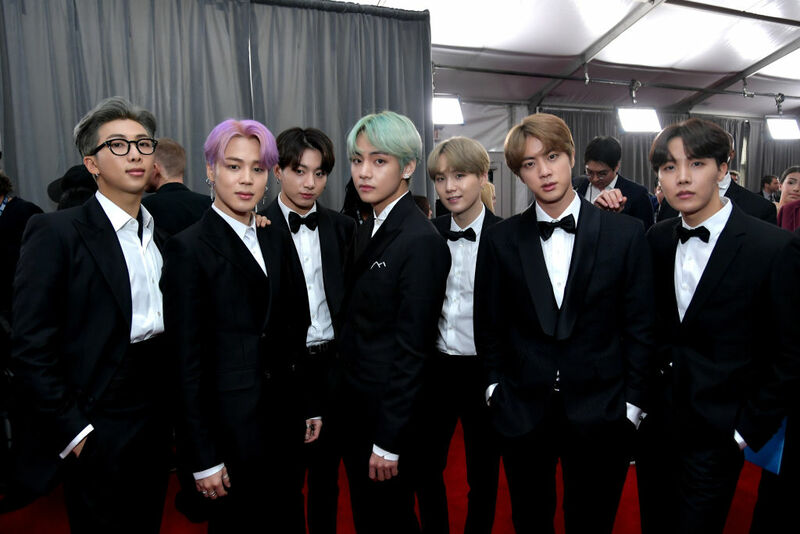 BTS showed up to the Grammy Awards in matching tuxedos. The K-pop group became the first Korean act to present an award at the event, delivering a Grammy to H.E.R. for Best R&B Album. It’s safe to say that Twitter freaked out when BTS got on stage. K-pop fans are some of the most enthusiastic fans in the world and they flooded Twitter with comments when they saw their idols on American TV. Janelle Monae is a fashion icon. I mean, look at this whole outfit. That geometric hat is everything, and that dress is giving me all the feels. I love Kacey Musgraves and all, by Janelle Monae’s Dirty Computer definitely deserved to win Album of the Year. I’ve always like Janelle Monae’s music, but Dirty Computer is on another level. She really stepped it up with this album and I’m glad she was recognized with a Grammy nomination. Camila Cabello always looks like a million bucks, but this fuchsia sparkly dress she wore to the Grammys was all kinds of right. I love the high neckline and form-fitting silhouette. Those teardrop earrings match her dress perfectly, and I love that she’s gone for a neutral lip. Camila performed at the Grammys this year, but she changed outfits for her theatrical, Grammy-opening performance of Havana alongside Young Thug, J Balvin, Arturo Sandoval, and Ricky Martin. Keep reading to see what Camila wore when she was strutting her stuff on the Grammy stage. Tyler Hubbard of Florida Georgia Line definitely took more of a risk with his suit than his singing partner, Brian Kelley. Those squares are way more visually interesting than Brian’s plain black suit. That being said, you can’t really go wrong with a classic black suit. Even though Tyler took more of a risk, I think Brian looks more put together. Their ladies also look very lovely. I love both of their Grecian-inspired dresses. Dolly Parton performed some of her many hits at the Grammy Awards this year, and various artists joined her on stage to help her out with those performances. Katy Perry and Kacey Musgraves sang a couple of songs with the country legend, who looked stunning in her white gown with red detailing. Katy Perry wore a red pantsuit with gold tassels, floral embroidery, and huge bell sleeves, while Kacey wore a red cardigan with similar floral embroidery and red skinny jeans. Miley Cyrus also joined Dolly Parton on stage. Miley and Dolly have known each other basically since Miley was born. Dolly is actually Miley’s godmother. Miley performed in a golden yellow pantsuit with tons of floral embroidery. She didn’t wear a blouse under her suit jacket, which has become something of a go-to look for Miley these days. She tied her long hair back into a ponytail and rocked some statement silver earrings. Before Miley sang her heart out on stage with Dolly Parton, she walked the red carpet in this suit jacket, of course, without any shirt or bra underneath. I told you this was becoming a thing for Miley. I think this look actually suits her really well. If I could get away with wearing a suit jacket like this in my everyday life, I totally would. Shirts are so overrated. Janelle Monae looked amazing on the red carpet, and she looked just as good during her performance on the Grammy stage. Janelle teamed up with a whole bunch of background dancers to create an unforgettable spectacle for all of the Grammy viewers. Lady Gaga was jamming out pretty hard to Monae’s performance of “Make Me Feel.” There are some videos of her dancing and headbanging along with the music as Janelle Monae was performing. St. Vincent is known for her dramatic fashion choices, and she stayed true to form when she showed up to the Grammy Awards in this black and white short dress with huge sleeves and a long train. St. Vincent always looks industrial chic. This look is very structural and impactful, but St. Vincent (AKA Annie Clark) still looks like a feminine android. Seriously, Annie always looks like she just walked out of Ex Machina. 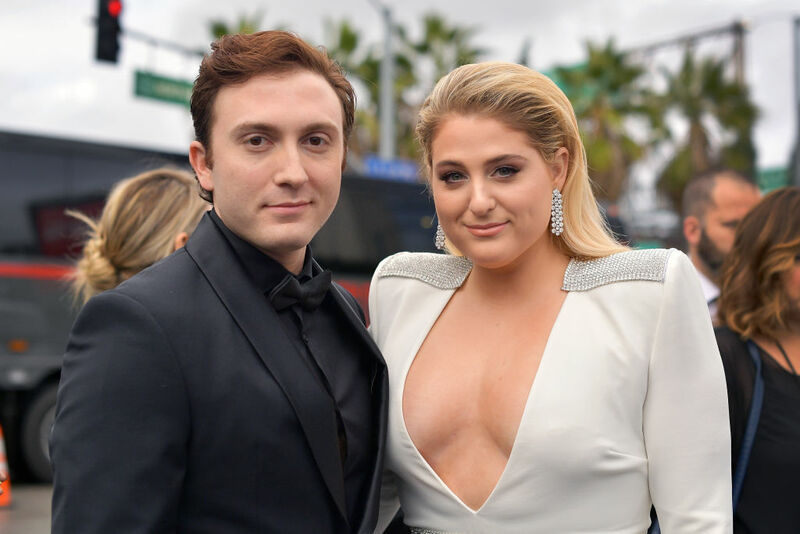 Engaged couple Daryl Sabara and Meghan Trainor showed up to the Grammy Awards looking their best. Daryl looked very sleek in his all-black tuxedo, and Meghan wore a light grey dress with a plunging neckline and structured embellished shoulders. These two already seemed like a match made in heaven, but in these outfits, they look even more like they’re meant to be. Meghan’s hair and makeup is on point and Daryl has really grown up a lot since his Spy Kids days. Cardi B’s red carpet dress was definitely something to behold, but her performance outfit also turned heads. Cardi showed off her rap skills on the Grammy stage when she performed in leopard print leggings, diamond-encrusted heels, and a sheer top. Cardi became the first solo woman to win a Grammy for Best Rap Album, and she decided to share her moment and her award with Mac Miller, who died just a few months before the big event. 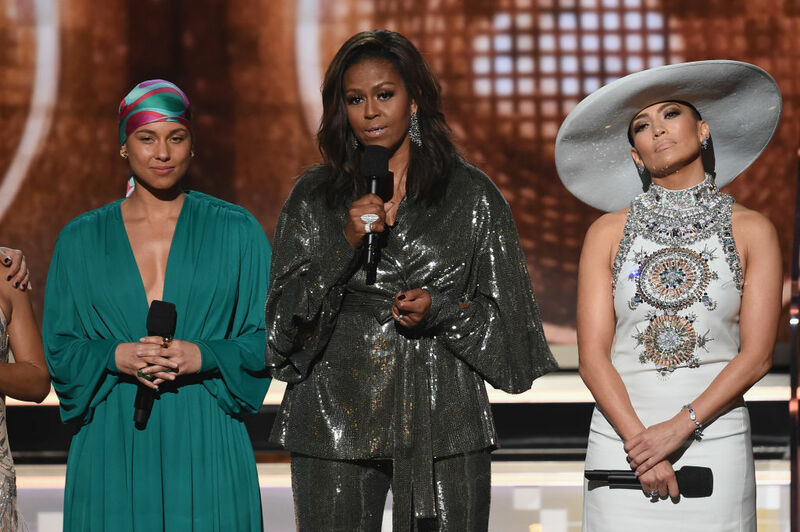 We’ve already talked about Alicia Keys’ teal dress, but can we talk about Michelle Obama’s pantsuit and Jennifer Lopez’s embellished, southern inspired dress? These three ladies all look fantastic, but I can’t get over Jennifer’s outfit. It looks like something straight out of Beyoncé’s Lemonade music videos. Michelle Obama’s sparkly dress is casting sparkly shadows on JLo’s hat, and I’m not mad about it. Everybody could use a little more light in their lives. Camilla performed in this gorgeous yellow two-piece dress that looks amazing with her skin tone. 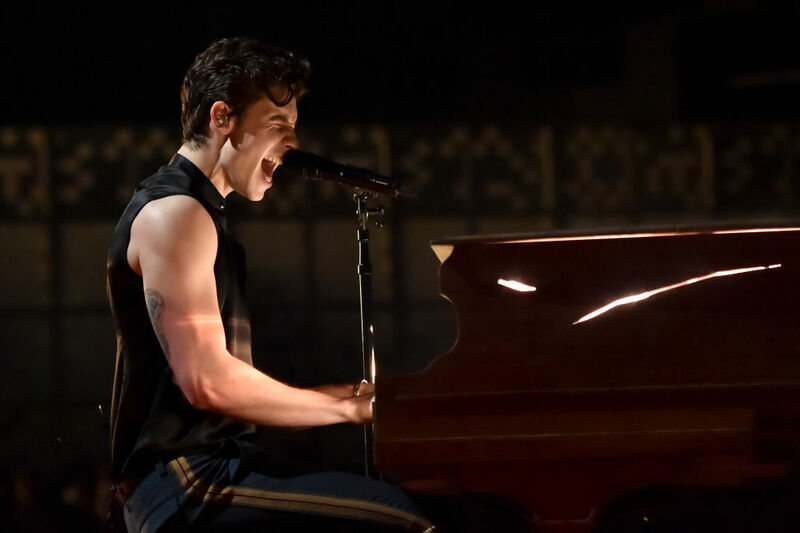 Shawn Mendes showed off his arms at this year’s Grammy awards. He performed with Miley Cyrus, who also wore a sleeveless top. I think Shawn’s muscles are better than Miley’s but I’ll leave that up to you to discuss. A lot of people took to Twitter to say that Shawn Mendes was reminding them of Bruce Springsteen in his sleeveless outfit. Shawn brought his father and his best friend, Manuel Mendes, to the award ceremony as his date.